Whether you prefer fantasy or 40k, these games do the best job of plugging into Games Workshop's universes. The sad truth about Warhammer games is that it’s much easier to round the bad ones than it is the good—something we’ve already done here on PC Gamer. But don’t worry about that right now. We’re here to celebrate the games that enrich your obsession with Games Workshop; the titles that put the ‘fab’ in ‘Fabius’. I’ve been ruthless. The dutifully average games lost in the warp between good and bad are nowhere to be found. Warhammer Quest is absent, as is Man o’ War: Corsair—a game as impossible to hate as it is to recommend. I’ve also left off the beautiful, doomed Warhammer: Age of Reckoning. It was decent while it lasted—the servers have long since been switched off - but it deserves a mention for having the most enthusiastic dev interviews in the history of gaming. Sit back and scowl through this disappointingly brief list of the best Warhammer games on PC. It’s nice to start with an easy one, isn’t it? After years in the 6/10 wilderness, Warhammer Fantasy fans were rewarded with two excellent Total War games in the space of two years. No more modding Medieval II. No more staring back wistfully at Shadow of the Horned Rat. This is the Warhammer world as it once was, brought to life with epic flair and a palpable love of the source material. Total War: Warhammer does an incredible job of pulling the camera back and letting you see the Old World from a distance, but it can feel impersonal. Warhammer: Vermintide 2, however, lets you get so close to a place on the brink of destruction that you feel every shattered bone and can inhale the singed fur. Vermintide’s tumbling cities and besieged farms are so perfectly imagined you sometimes wish the Skaven hordes would slink off and let you enjoy the scenery in peace. At least, you would if killing them didn’t feel so good. Smashing through swathes of rat men is a messy, ichor-spewing joy. It’s even better in the second game, thanks to the variety and threat that comes from the inclusion of Chaos and some gruelling new bosses. Few multiplayer games can hold your interest like Vermintide 2: every run is different and the loot grind is compelling enough to keep you playing forever. Add specialist classes for the five characters, and this is as detailed and loving an examination of Warhammer Fantasy you’ll get this side of painting your own Ironbreakers. Perhaps it’s slightly disappointing that one of the best games on a Warhammer list is the comedic sporting spin-off—or perhaps that’s exactly as it should be. But Blood Bowl 2’s muscular, turn-based take on American Football is distracting fun, and an improvement over the slightly bewildering original. It also does a great job of highlighting the contrasts between the warring Warhammer Fantasy factions who, for reasons I daren’t explore, have decided to stop invading each other and play footy instead. Elves are all about swift runs and crisp passes, for example; whereas orcs just want to wreck everything. The result is an unusual, initially impenetrable game that looks great and improves the more you play. Unlike the Blood Bowl players themselves, who will probably end up crippled or dead. Touchdown! Back before we dared dream about orc siege towers rolling in real time towards the walls of Karaz-a-Karak., when Archeon was still known as Diederick to his mates, strategy fans had to make do with Shadow of the Horned Rat—a fine, story-driven strategy game that gave us a glimpse of what Creative Assembly would deliver on a massive scale 21 years later. Playing as Morgan Bernhardt, you can follow the main quest and defend the Empire from orcs and skaven, or customise your missions in a quest for boundless wealth. It’s progressive stuff for the first ever adaptation of the tabletop game. It’s dated now, obviously, and the version of GOG.com is apparently has some technical issues when running on modern PCs, but get it to work and you’re essentially experiencing Warhammer RTS royalty. 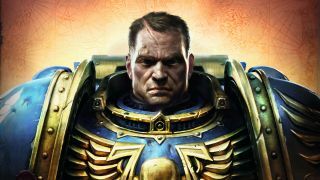 Space Marine received mixed reviews upon launch, but if you’re after relentless violence, grim darkness or eternal war—the Three Amigos of the 40k universe— there’s something here for you. Mark Strong is perfect as anvil-in-the-service-of-The-Emperor Titus, who slices, shoots and curbstomps his way through more orks than it’s conceivable to count, before the forces of Chaos turn up and characteristically ruin everything. It’s the perfect, mindless way to lose a Sunday afternoon: pop Space Marine on your Steam sale wishlist and suffer not the Xenos to live. It’s what Roboute Guilliman would have wanted. Ahh, the Tau. The artisan burger yurt to the Space Marines’ Drive-Thru McDonalds. It doesn’t matter if you think they’re the greatest hope for peace in a galaxy, or another alien race to flatten; all you need to know is that they have lovely guns and firing them feels nice. If that sounds like faint praise, it’s because Warhammer 40,000: Fire Warrior is okay. A flighty, fun, by-the-numbers FPS that stands out because many of its fellow 40k games are deeply average and because any game featuring pulse rifles can’t be all bad. It’s also fascinating because it’s such an odd choice: the Tau are surprising heroes for a spin-off game—lovely guns aside—and pitting them against the Imperium of Man is a curious reminder that yes, the genetically-modified, systemically intolerant space racists with skulls on their shoulder pads probably are the baddies. Except, y’know, when they’re not. The original 1993 release of Space Hulk could probably be on this list, because it cleanly recreates the horror of being a walking man-tank trapped in a corridor full of monsters. But the 2013 update looks nicer, and crucially, is much easier to buy. In both cases, the games are worth your time because the original board game is so good—it’s asymmetrical strategy at its finest, with lumbering but powerful marines facing off against a highly mobile force of unknown numbers. It’s a generous game, too, with a meaty campaign and free updates released as a thank you to the fans. Does it compare to playing the original on the grimy carpet of a trusted, 40k-loving friend? Probably not. But it’s far simpler to track down, and the brutal genestealer AI will make you feel like you’re actually taking on a cerebral alien threat. Lovely. It’s madness that Dawn of War III somehow ended up on our list of worst-reviewed Warhammer games on Steam. But let’s not get into the reasons why, and instead agree that whatever you think of Dawn of War’s recalibrated trajectory, the second game is still worth celebrating. There’s an absurd amount of content here, drawing in diverse races from the entire 40k universe. And it feels right; like your favourite miniatures brought to life before you. Forces hit with a satisfying wallop, and it’s as grim, dangerous and ultimately satisfying as the most hard-fought tabletop battle. While the multiplayer elements seem lightweight compared to its MOBA-influenced sequel, the single-player campaign is a notable improvement over the brilliant original. If you enjoy the original Dawn of War 2, be sure to try Chaos Rising and the excellent Dawn of War 2: Retribution. The three-player Last Stand mode is immense if you can get some friends together.